Truly one of the great character stars of Hollywood’s so-called Golden Era, Main was an absolute delight to watch in the myriad films she appeared in from the early 1930’s through the end of the 1950’s. Although she is principally remembered for comedic roles, Marjorie could also excel in drama, take for example her brilliant turn as gangster Humphrey Bogart‘s mom in Dead End (1937) or as the blind woman in The Shepherd of the Hills (1941). Woe betide the unlucky co-star who had to work with her because she’d steal everything but the cameras. 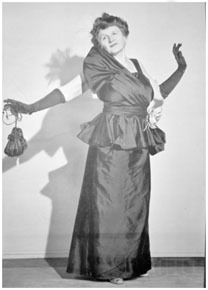 By the time Krebs died in 1935, Marjorie was well established on both radio and the Broadway stage and had already been summoned to Hollywood for a few pictures. Within a few years, she was there full time and over the next two decades she became one of the most important and well liked character stars in the movies with a string of memorable roles in such classics as The Women (a reprise of her Broadway role), Meet Me in St. Louis and The Harvey Girls. But her most enduring legacy is that as the robust country bumpkin Ma Kettle, which she played to great success in ten films starting with The Egg and I (1947). Although she officially played second fiddle to Claudette Colbert and Fred MacMurray in that film, it was Marjorie who earned the Academy Award nomination. Offscreen, Marjorie was a very private person who lived very simply. Hedda Hopper declared, “Her tastes are almost spartan in their simplicity,” adding “I have never yet seen her at a party or a night club.” Unlike her friend Peter the Hermit though, Marjorie was no hermit herself, having a number of friends and a keen interest in psychic phenomenon and mysticism, a legacy of her late husband who frequently lectured on the subjects around the country. 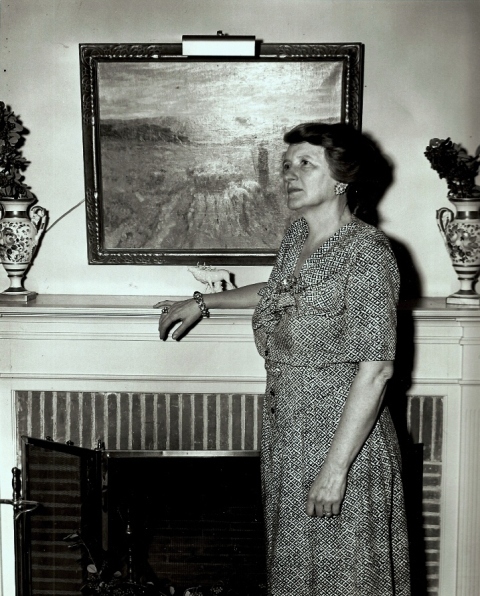 Marjorie was devoted to the memory of her late husband and never remarried or was known to be romantically involved with another man for the rest of her long life. In recent years, certain published sources have claimed that Marjorie was a lesbian, which if true, makes her, in my opinion, all that much more fascinating! Marjorie claimed to have not purchased a car or a house until she was 50, generally making her way around town by hoofing it or by bus. The house she purchased @ 3066 Patricia Avenue in the Cheviot Hills, which ironically Peter the Hermit helped her find, was a charming moderneish 1936 colonial built on a sloping lot in close proximity to MGM Studios where she had been put under contract in 1940 as “the next Marie Dressler.” In spite of her simple lifestyle, Marjorie did allow herself one “Hollywood” excess, a desert hideaway @ 1280 Calle Rolph in Palm Springs. She passed away in 1975 at 85. This entry was posted in Interesting People, West L.A. and tagged Character People, Cheviot Hills, Ma and Pa Kettle, Marjorie Main, Percy Kilbride. Bookmark the permalink. It’s just getting better and better!! How could you not love her! Really enjoyed seeing this bit of her personal life. 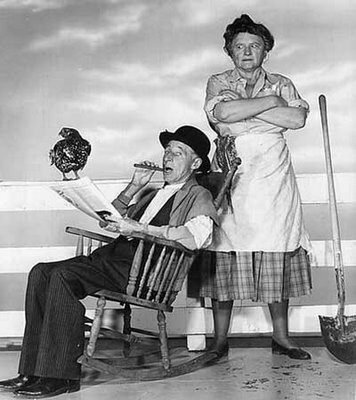 I loved Ma & Pa Kettle. The Egg & I, when I was about 9 yrs old. So glad you shared this with us!Later, when I had my own children, I took alot of Inspiration from Ms.Main and her character…and I have to say….my kids are alright! Thanks, again for sharing. Ma and Pa Kettle has the Tony the Tiger connection. The actor in the movie, “The Kettles on Old MacDonald’s Farm,” Roy Barcroft, was the first cousin once removed of the Tony the Tiger voiceover, Thurl Ravenscroft! They’re grrreat! Thanks for the info on Ms main. She was one of the delights of my childhood with Percy kilbride.